Where to begin?! About a year ago, Ryan, knowing my love for road trips, tossed out his idea about driving the Dempster Highway from the Klondike Highway to Inuvik, NWT. He had planned this a year prior with his father, but they elected to conquer the PCH down to San Diego instead. 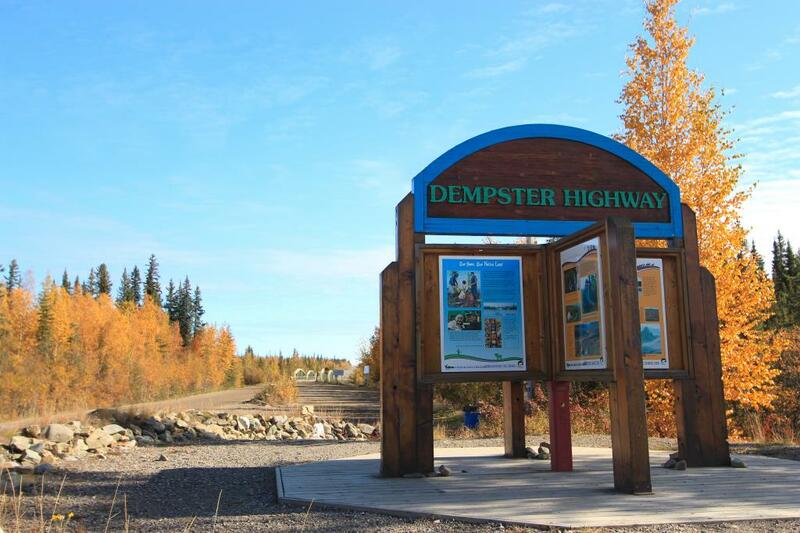 The Dempster is a highway renowned for its beauty, remoteness and…lack of pavement. 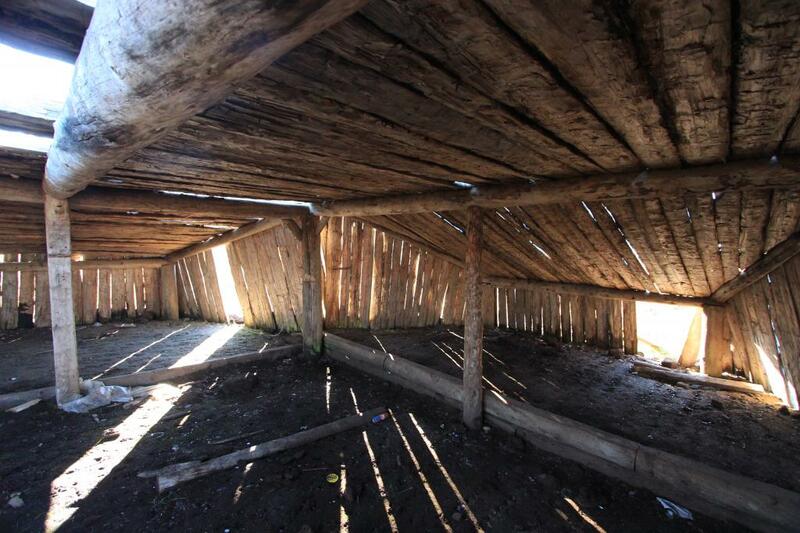 Its freeze/thaw cycles and a substructure composed of up to 8 feet of gravel insulates it from the permafrost. So from there, the planning began. When driving a road like this, a 1,500-kilometer round trip of rock/shale/gravel in mediocre conditions at the best of times, in addition to 5000+ kilometers of highway to get us there and back, you’d elect to travel in a more roomy, comfortable vehicle with creature comforts and a sense of reliability such as my new Jeep Wrangler Rubicon. 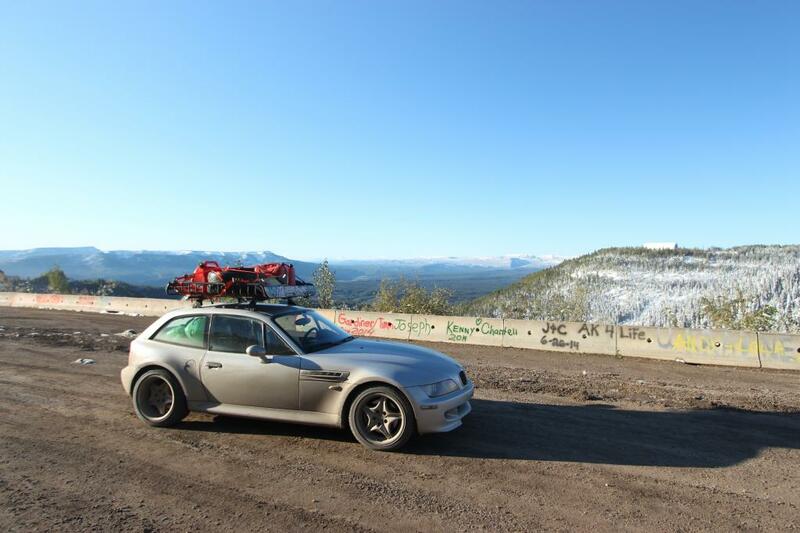 However, being the gearheads we are (read idiots), we chose to tackle this trip in Ryan’s 2001 BMW M-Coupe. That’s right, a two-door, two-seater, hatchback, with MMMMMuch more power than the Jeep! 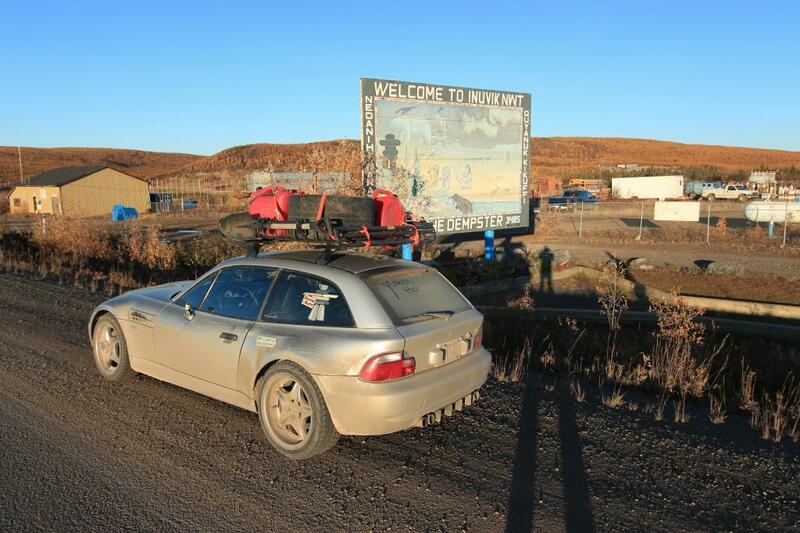 Then and there, “Inuvik or Bust” was born. Day 1: This leg of the trip was the grueling, boring, drab, flat, and ironically the only real snow-filled part of our journey. 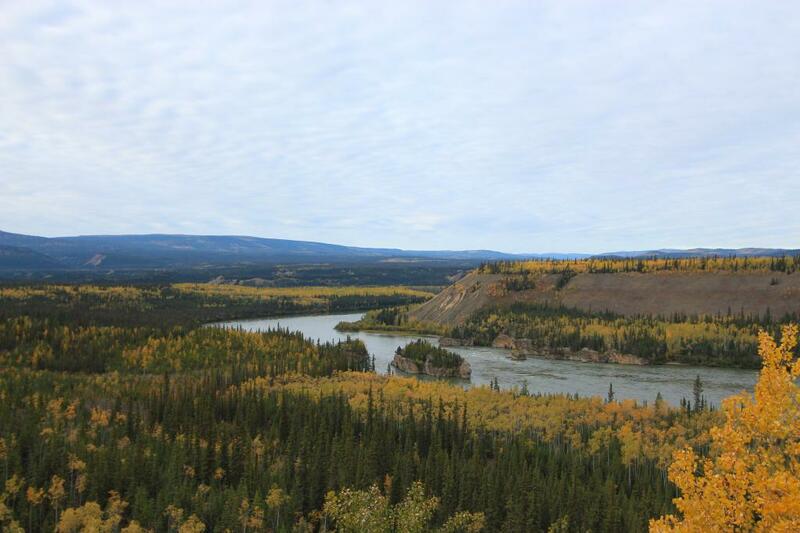 A 1,000-kilometer jaunt from the hole in which we live to the hole that is Fort Nelson, BC. Neither the camera, cell phones, nor GoPro bothered to snap a picture of this portion of the trip. After stopping for a beer and a bite to eat in Dawson Creek, passing the 0.0 mile marker of the Alaska Highway, we carted along though oil country and (barely) landed ourselves in Fort Nelson by 9 p.m. With three empty jerry cans strapped to the roof rack (to be filled at a later date), the car was sniffing on fumes as we pulled into the Petro Canada gas station. We sat there laughing at the potentially hilarious/infuriating situation we nearly found ourselves in. 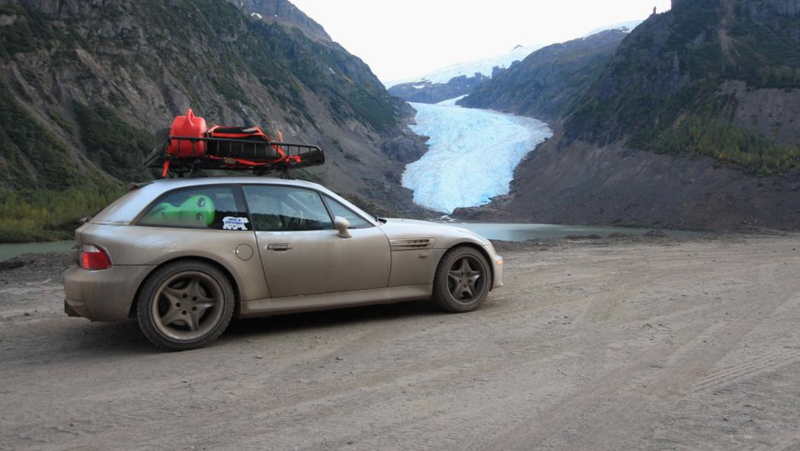 Stranded on the side of the road…with an abundance of empty jerry cans…IN BRITISH COLUMBIA! Needless to say, we were far more cognizant of our fuel levels from there on in. Grabbing a room at the first hotel in sight, we dropped our bags and found ourselves crushing beers at the nearby Boston Pizza. Day 1, success. Day 2: With a bright and early start to the day, we filled up a jerry can (we’re learning!) and forged on (to the closest Tim Horton’s for some ****ty coffee and breakfast). We had 950 kilometers of gorgeous terrain to cover today. 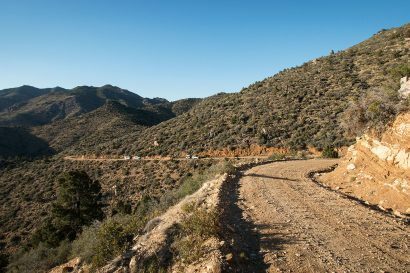 The sweeping highways skirting the mountains provided us with many excuses to stop, look around, and snap some incredible photos. Sadly, photos hardly do this area of the world justice, so you’ll have to take my word for it; view my pictures with a grain of salt, or better yet, make the drive yourself! After 250 kilometers of sweeping corners, dips, climbs, valleys, and cliffs, we pulled over next to Muncho Lake and Strawberry Flats as recommended by my aunt. The lake was smooth as glass, and equally clear. This whole leg we found ourselves simply saying, “Wow.” This place was no exception. At this point I jumped into the driver’s seat, though in hindsight, I wish I hadn’t. No more than 20 kilometers up the road the M-Coupe (more specifically Spiff_D’s roof rack) gave a mountain goat some complimentary facial reconstructive surgery. Coming over a hill crest, Ryan pointed out three mountain goats grazing in the opposing ditch. Punching the brakes got them spooked and they darted diagonally across the highway in our direction of travel. Inching further and further onto the shoulder and now partway into the ditch, there was no escaping them. In one swift suicidal leap, the largest goat of the three introduced itself to the roof-rack. Be it the impact of the goat or how far we were now into the ditch, the German missile of mass destruction drifted out of gravel and to a halt back on the shoulder. With a barrage of explicit words now escaping my mouth, we both hopped out to assess the damage. The goats head bounced off the roof rack into the roof, its chest devoured the driver’s side mirror as its lifeless body ricocheted off the rear quarter panel and into the ditch. Poor goat some may say…well, screw that suicidal goat. Poor BMW! 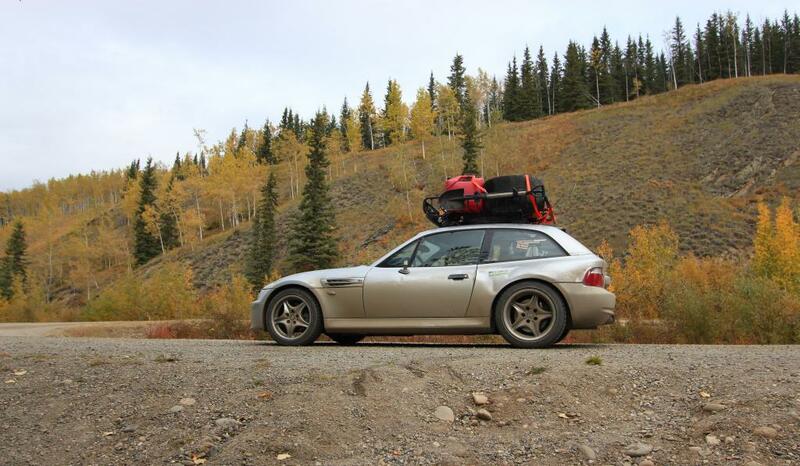 Of all possible mountain goat vs. BMW outcomes, we were fortunate with the best result. The car, though now looking worse for wear, was still drivable. We forged on. Escaping the herds of wild bison grazing alongside the highway, we landed ourselves in Whitehorse at 7:30 p.m. and were very much looking forward to a home-cooked meal at my aunt and uncle’s house. After a phenomenal meal of moose stew, wine, and an amazing evening of catching up and exchanging stories, we retired to the hotel and grabbed a few pints in the downstairs bar: the Sternwheeler Saloon. Thanks again Aunty Netty and Uncle Pete! It was great visiting with you and Benjamin again! Day 3: Today marked one of the trip’s shortest driving days at 550 kilometers. But with the scenery becoming increasingly more beautiful the further we went, the drive was pleasantly broken up by numerous stops, lookouts, and CINNAMON BUNS! If any of you folks finally get over the “one day” bull**** and actually make the journey out to the Yukon, you must stop at Braeburn’s big buns at the Breaburn Lodge. The cinnamon bun was quite literally as big as my head (and I have a damn large noggin). As we neared Dawson City, we stopped at the beginning of the infamous Dempster Highway for a quick picture before making a 25-minute rounder up the Dempster to check conditions. Everything looked great. Now it was beer-o’clock and Dawson City was calling our names. 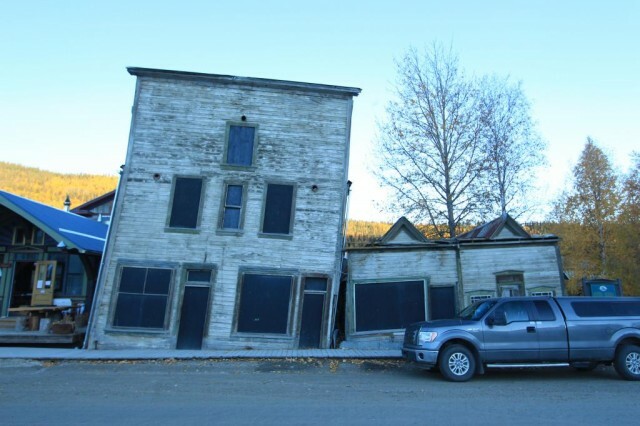 Day 3 (Continued): Dawson City, Yukon. Holy crap. I’ve heard that this city lures people in, and they never want to leave. I now understand why. Streets made of mud and dirt, sidewalks made of wood, buildings still standing from the gold rush days. What a wicked cool feeling. After lining up accommodations for the night, we climbed the stairs to the hotel’s patio bar and crushed some well-earned lunch and beers. 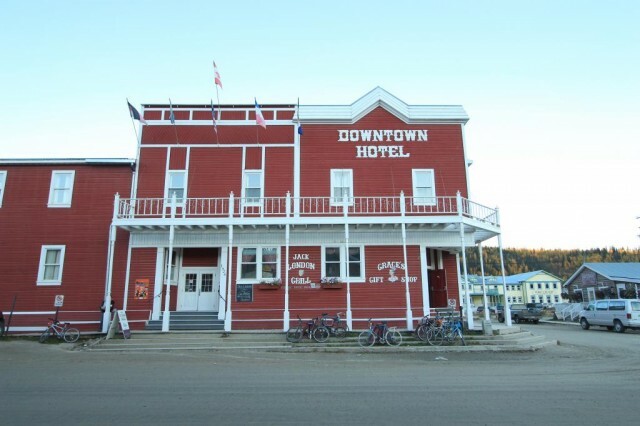 Talking to our bartender/server, we got the lowdown on what to do in Dawson. He pointed us in the direction of a couple spectacular lookouts and the first gambling hall in Dawson, Diamond Tooth Gerties, and our night was more or less planned out for us. Getting back into the car, we drove down the main street and onto the ferry to the first lookout of Dawson. As you can see in the pictures below, it’s pretty spectacular. As we sat and enjoyed the view, regretting that we weren’t smart enough to have cold ones sitting in the empty cooler, an American couple stopped in as well. They particularly enjoyed the Band-aid Ryan placed over the rear quarter which sparked up a little conversation. They too, were going to the Drunken Goat Taverna for some eats and drinks tonight! (Damn goats.) So we told them we’d see them later and darted back down to the ferry. Zipping through town, we carted the coupe up the long winding Dome Road to the second lookout (the Dome). Once again, wow. A 360- degree view of Dawson City, the hills of Alaska, the Yukon River and the mountains in which we will drive through the next day, and the launch-pad for paragliders! 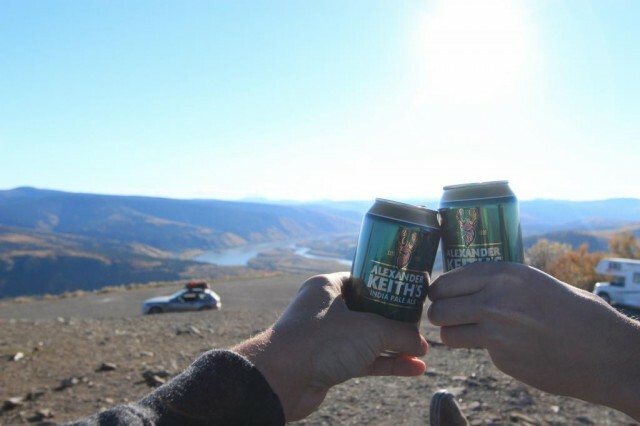 After watching a man chuck himself off the ledge, enjoying a ridiculously overpriced ($4/can of Kieth’s overpriced) beer, we decided to return to the hotel, park the car for the night, and let the golden nectar of the Yukon Brewing Company make poor life decisions for us. As we set out to walk the town, we saw this dirty, almost equally hard done by WRX, sitting on the side of the road with Ontario plates on it. Pointing at it and chuckling as we walked passed, the owner who happened to be just up the sidewalk called us out. She and her parents were in town for a few days and after introducing ourselves and exchanging a few stories, we agreed to meet up again at Gerties for the midnight burlesque show. The Drunken Goat Taverna. Pitchers started coming and going, probably faster than they should have. Toast to the goat, right?! The American couple we met earlier walked into through the front doors and this train was now a runaway. The Mrs. wasn’t all that pleased with the Mr., as six pitchers later, her husband had quickly caught up to us in levels of intoxication. We probably should have ordered more than just calamari and pita bread with tzatziki, but c’est la vie. After the Mrs. managed to drag her staggering husband out of the bar, it was 11:30 p.m. so we grabbed our tab and rushed over to Gerties. MOAR beers! The show was solid, reminiscent of the olden day’s cabarets, and quite entertaining. In comes Miss Ontario! Drinks, spirited discussions (drunken arguments), drinks, gambling (aka too drunk and I may as well have been handing my money straight to the dealer), we closed that place down. Now what?! It is 2:30 a.m. and everyone still had energy to keep going. So we invited our new friend and her parents up to the hotel to crush what remaining beers we had left. What a great evening with amazing people…great stories and even better memories (well, the ones I remember at least). It’s now 5:00 a.m. and time to go to sleep, so after exchanging contact info, off they went and it was time to catch some shut eye. Day 4: Uuggnnnhhhhh. 7:00 a.m. and our alarm clocks were screaming at us to get up. What were we thinking last night?! Also, where’s the camera? ****. Turning the hotel upside down, the DSLR was missing. I recalled having it at the Drunken Goat, bringing it to Gerties, but now it’s gone. I tried calling Gerties, but they were definitely closed. After some quick showers to feel half human, we went to pack the car and start our journey to Inuvik. Low and behold, there the camera was, sitting on the cargo cover in the back of the BMW. WTF?! When and why did I decide that would be a great idea?! Herp-a-la-drunken-derp. Forging on, no radio, no talking, nothing this first hour of the day. Let me tell you, gravel roads and swerving to avoid potholes and protruding rocks is the least amount of fun on 2 hours of drunken sleep and an increasingly vengeful hangover. 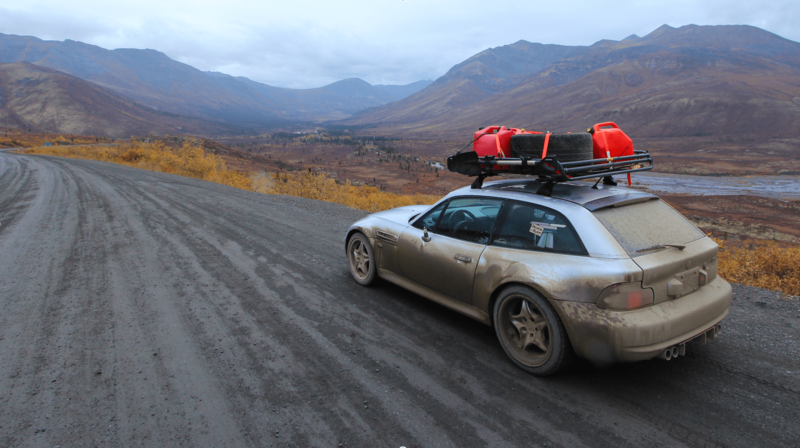 We got 70 kilometers up the Dempster to the Tombstone Territorial Park Interpretive Center and both needed a break. Opening the doors to the interpretive center, the smell of bacon, coffee, and French toast filled the air. Sheepishly, we dragged our feet around to their break/lunch room and offered the ranger girls $20 for a coffee. Being the kind souls that they are, and seeing us in the piss poor shape that we were in, they welcomed us in and fed us a hot cup of joe. This was their last day for the season and they, though incredibly friendly, were a wee bit too chipper and cheerful for us in our current states. Thanking them for the quick recharge, we continued onwards. If you make it to the Yukon, and you are not feeling adventurous enough to make it up to Inuvik, you must, at the very least, explore Tombstone Territorial Park. Apparently we came a week after the best of fall colors, but as you can see below, it was still incredibly beautiful. Moseying along, we soon found ourselves in Eagle Plains, the halfway point on the Dempster. In desperate need of some nourishment, we made our way into the diner and were welcomed with breakfast menus. YES!!! Our excitement was nearly shattered when he told us breakfast was over, but we convinced the man to cook up some bacon and eggs and tipped him handsomely for his efforts. Hangover cured. Next stop, the Arctic Circle, a feat in and amongst itself. 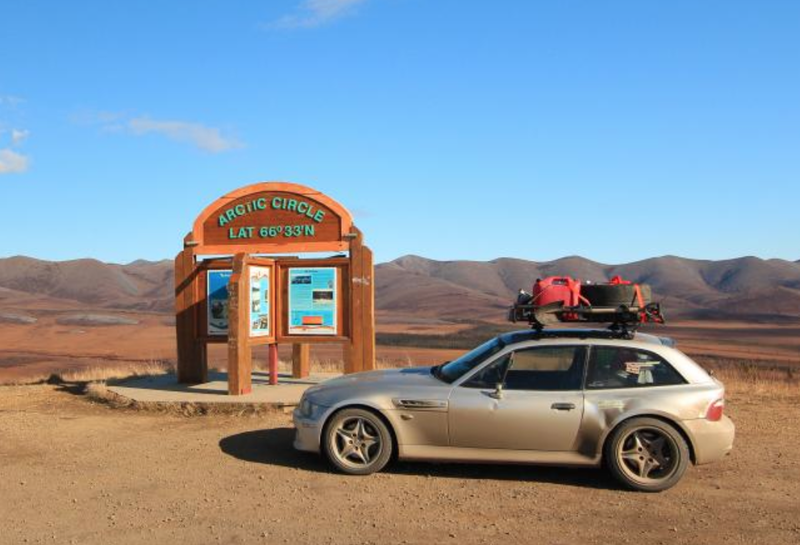 Ryan believes his little clown shoe is the first to ever cross the circle, and the furthest north a BMW M-Coupe has ever been which is pretty f’n cool in my opinion. Next stop, the Northwest Territories. 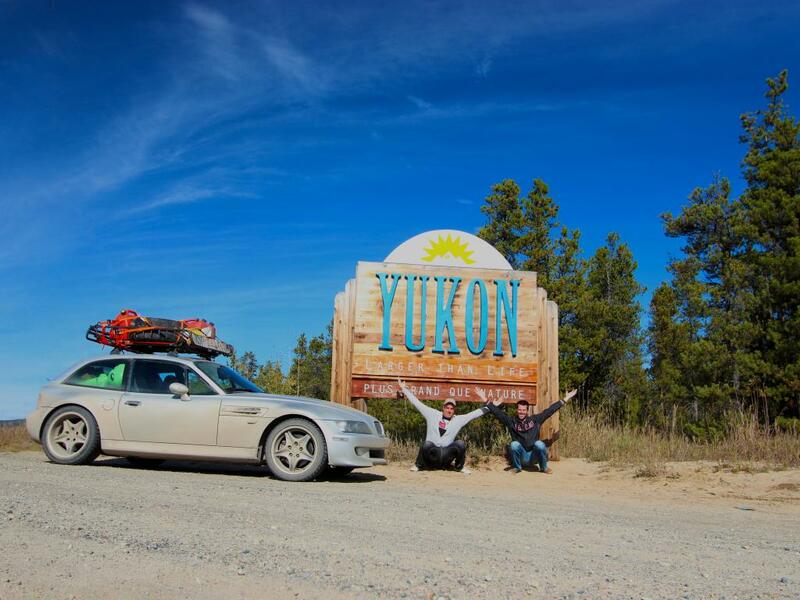 Taking the touristy, but necessary pictures, the next stop was Inuvik. Onward, ho! Boarding and unboarding two ferries, we were on the last leg. And sooner than expected, we were in Inuvik. Successful Dempster leg was successful! 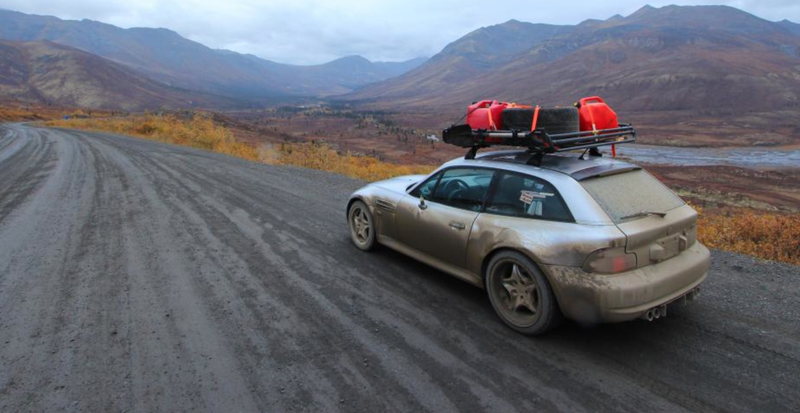 Ironically, the worst section of the Dempster highway, was the final 15 kilometers of PAVED roads from the airport into the city. Permafrost and frost heave means asphalt was a piss poor idea. Damn civil engineers. What time is it? Beer o’clock! Ditching our bags in the Nova Inn, we made our way to Shivers, a local pub, for some grub and more Yukon Brewing Company goodness. Day 5: Let’s go to Tuk! Our previously arranged Mackenzie Delta Tour to Tuktoyaktuk got delayed due to weather, so after getting up at 6:15 a.m. and waiting in the hotel lobby for an hour, we resigned back to the hotel room for some more ZZZZZs. Well, Ryan did. Apparently mid-afternoon naps are still a thing and he hasn’t been getting any of them, so he crashed, while I surfed the interwebs for things to see and do in Inuvik. By about 10:30 a.m. he begrudgingly got up, showered, and we were out walking the streets and checking out the town. Inuvik is entirely built on permafrost, so every building is built on piles and/or stands off the ground insulating the buildings from melting the ground below. Even the utilities are routed through corridors throughout the homes and buildings in insulated and elevated utility viaducts sitting on steel piles. The civil engineer in me was intrigued and impressed at the work involved. As 3:00 p.m. rolls around we head back to the hotel to be chauffeured off to the airport. And by chauffeured, I mean beat up in the back seat of a 15-passenger van on the bumpiest, most frost heaved road in existence. Edmontonians, you don’t even know. This was my first time being aboard a plane smaller than a ****ty dash-8. So from outward appearances, this little Cessna seemed pretty legit. But as we boarded the plane, I soon saw that was not quite the case. Ryan, a pilot himself, assured me it was no big deal… but when finding that the doors don’t quite close, the headliner is falling off the roof, the interior plastics are cracked, and numerous rivets holding this jalopy together are missing… I was reasonably concerned. The 45-minute flight went smoothly, as we circled some pingos (mini ice formed mountains), we landed safely in Tuktoyaktuk. 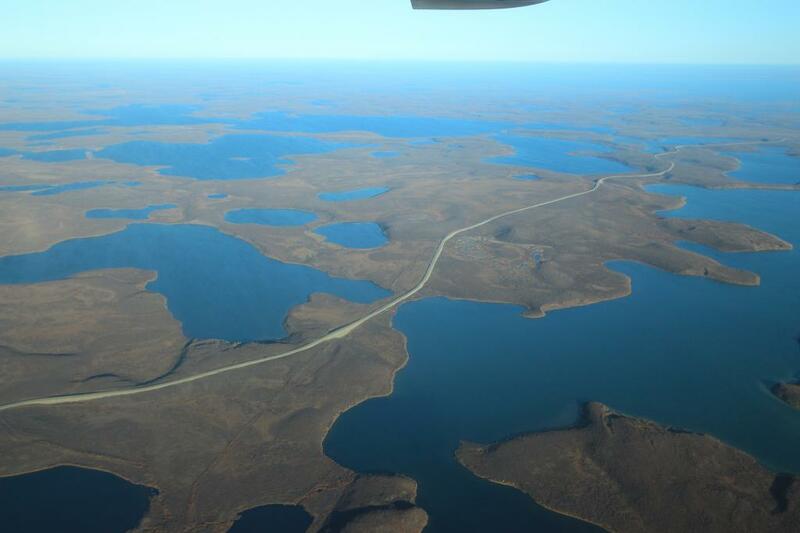 Originally I thought Inuvik was desolate. 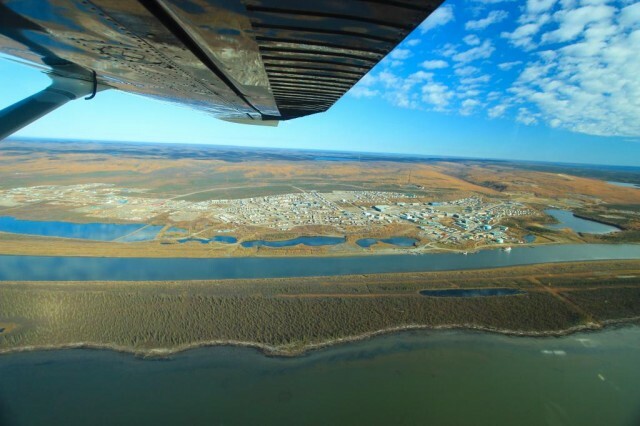 As Ryan perfectly put it, Tuktoyaktuk makes Inuvik look like Toronto. The tour of Tuk was eye-opening. We visited the oldest building in Tuk to the boat the early missionaries used to transport the local natives to and from school, walked in and around a traditional igloo that is still intact, and visited many other historical sites in the village (all pictured below). Our tour guide also let us explore the town’s ice locker. We climbed 30 degrees down an unlit shaft deep into the permafrost. Out came the camera phones and their flashlights as we explored the three different branches of this underground maze. There, in the 21 marked rooms, is where they used to store (rarely used today), the scores of their hunting trips which consisted primarily of caribou and whale. Clambering back out of this frigid little meat locker, we walked to the end of the Trans Canada Trail. This is where, arguably, we did the most idiotic thing on the entire trip. We came prepared with bathing suits and towels and plans to jump into the Arctic Ocean. It was windy and about 1 degree out, and with only one foot in the frigid water, my cojones had already receded into my chest. By the time I walked out far enough for the water to be up to my thighs, I couldn’t even feel my feet. So instead of diving in, freezing solid, and floating away into the ocean to never be seen or heard from again, I ran back to shore, dried off, and tossed on my jacket. Then I played the waiting game…waiting to regain feeling in my feet, and waiting for my balls to drop so I could place them in my newly acquired purse. Yup. I bitched out. Well, we both did. It’s beer o’clock, and I’m cold and miserable— take me back to Inuvik please. So off we went, and we found ourselves, once again, back at Shivers for some more pub grub and brewskies. 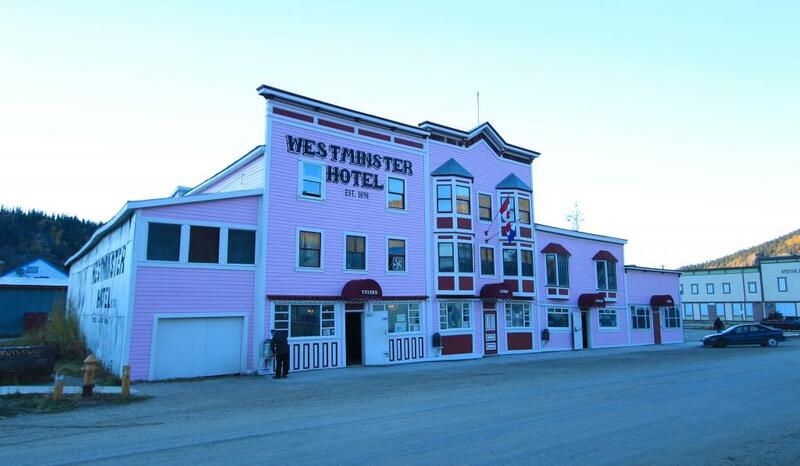 Day 6: Well, as interesting and fun as the Northwest Territories were, Dawson City was calling our names. 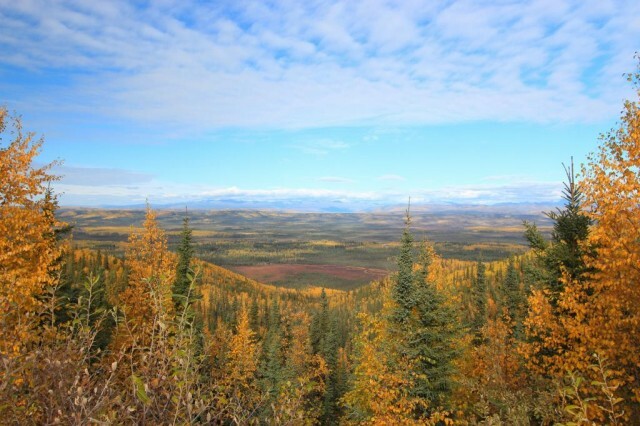 Back down the Dempster we go! Waking up and catching a beautiful sunrise, we were back on gravel with the Yukon in our sights. Scraping our way on and off the ferries, the skies decided to open up and down came the rain. 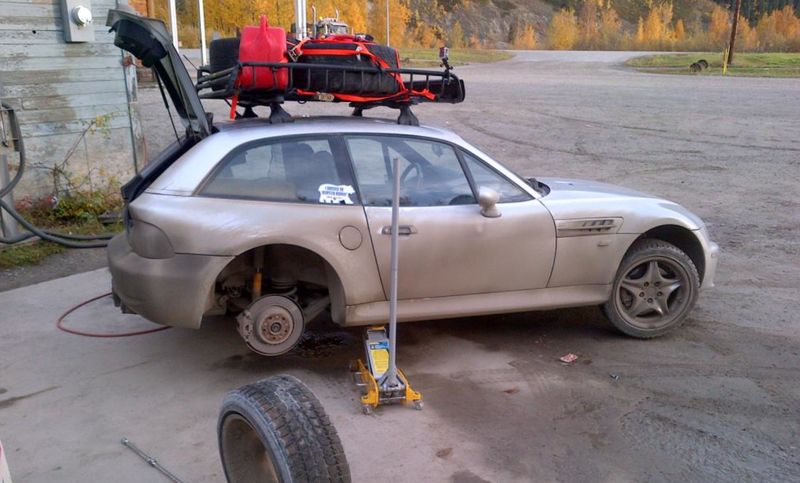 Man-o-man did the ol’ M-Coupe get dirty! Being that we’ve already stopped and wandered the outlooks and tourist stops, we barreled down the highway with zero hiccups or holdups. 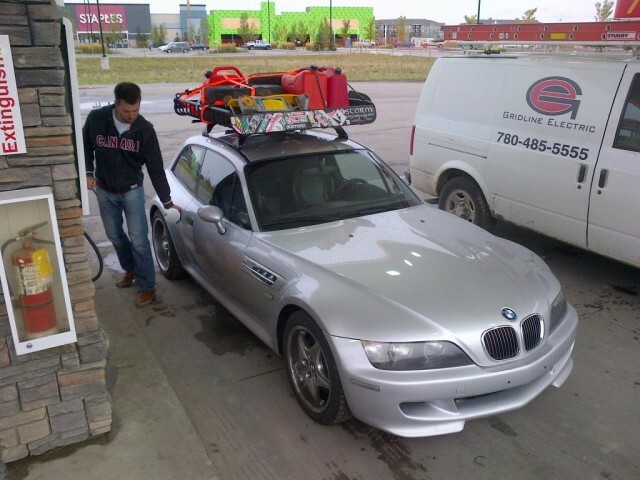 Fueling up both our stomachs and the ever-thirsty BMW in Eagle Plains, it was the home stretch to Dawson. Surprisingly, be it from lack of hangovers, or maybe because the roads got groomed while we were in the NWT, the roads seemed smoother. Smooth enough that we were able to maintain an average speed of 100 kph! We did, however, stop for one last view of Tombstone. My goodness, it’s gorgeous. I need to, no, I WILL come back here. Fancy that, it’s beer o’clock! We tied the ol’ noble steed’s reins up in front of the Aurora Inn and went on foot in search of beer. Happening upon another recommendation of my uncles, we strolled into Bombay Peggy’s Pub. After demolishing a few pints I was getting hungry. We then found out they didn’t serve real food… only appies. So away we went to a familiar place, the Drunken Goat. Toast to the goat! Beers and dinner served, we wondered back to Gerties to try and win back some of the money we lost 3 nights prior. Oh, how foolish we are. I proceeded to donate another $250 to the roulette table, $50 to the blackjack table, and $60 to a dirty thief at the poker table. Blast! So we closed our empty wallets, crushed a few more beers, enjoyed some cabaret and called it a night. Day 7: These days were getting longer and longer. Being 6’7” and coupe-d up (ba dum pshh) in Ryan’s little car is wearing on the both of us. Thank goodness it was yet another relatively short day of driving. However, this trip wouldn’t be complete without a flat. I mean, we were prepared for one… we damn well better get one. We were then successful (if you think about it in a backwards sort of way). 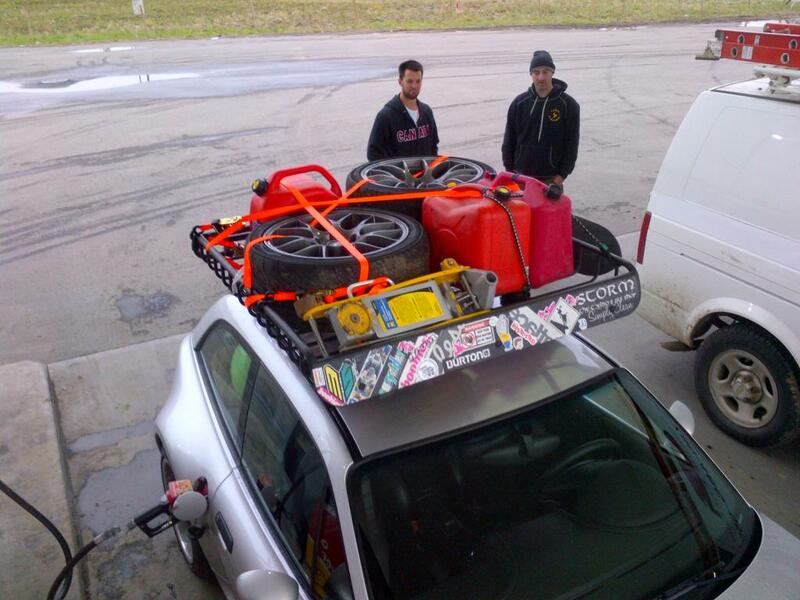 Limping the car to the nearest gas station, we filled up the right rear tire enough to get to the local tire shop. Their schedule didn’t quite jive with ours, so instead of being lazy, we busted out the jack and the patch’n’plug kit and got at it. Now, neither of us has ever plugged a tire. That’s what we have Kal-Tire for. So the whole thing was a learning process. Ryan’s understandable hesitation to enlarge a hole in a $450 tire had us trying to smash a plug into the sliver of a puncture with the plug tool and a 4×6 piece of lumber. A local saw us, probably struggling to contain his laughter, and gave us some a few tips and tricks. Within 20 minutes, the tire was plugged, aired up, bolted up and we were back on the road! The fiasco cut into our day by about 2 hours all said and done, kiboshing our plans to race out to Skagway that afternoon for a beer. So, once again, traversing roads already travelled, we beelined it to Whitehorse as we had made plans to meet up with Bailey (aka Miss Ontario). I’m still unsure how we convinced her to hang out with us retards another night, but a familiar face along the journey (that wasn’t Ryan’s) was certainly welcomed! Hunkering down at the Ramada, Ryan ran across the street to see if Fountain Tire had some reasonably priced all seasons to replace our weathered winters, but no such luck. Why would they have low-profile tires in a pickup truck city? 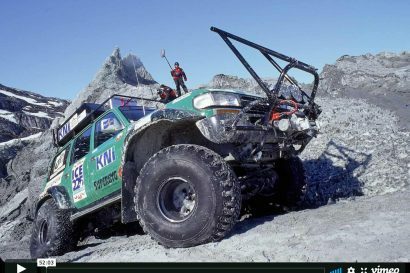 Oh well, the tires appeared to have enough tread to take us home. Beers beers and moar beers! Back at the Sternwheeler Saloon (hotel bar), Bailey joined us for a few pints before heading to Earl’s for some eats. In a more coherent state, we learned that she had not only out road-tripped us (umpteen thousand miles travelled and far too many states that I lost count), she also loves Top Gear. The real Top Gear, none of that American garbage. Pretty rad. With an interview the next day, she couldn’t hang out until all hours of the night, so when she left and wished us luck, we pounded a few more beers and with 1000 kilometers of road in front of us the next day, we called it a night. Day 8: It is 7:00 a.m. and back at ‘er! 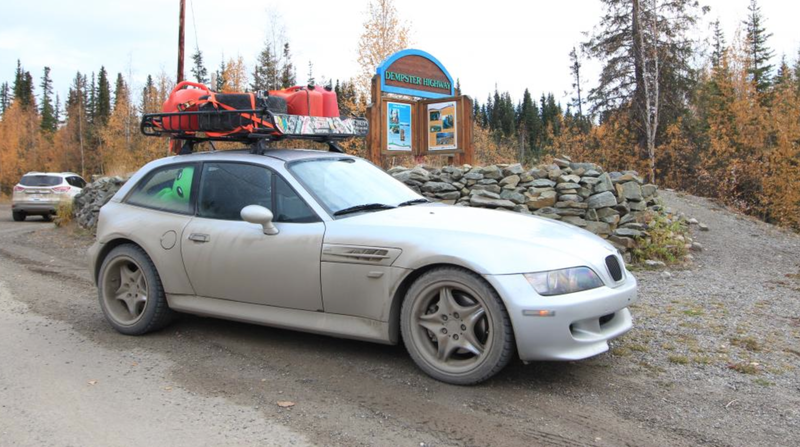 The final 400 kilometers of backtracking before blazing 600 kilometers of fresh tracks down the Stewart-Cassiar Highway. 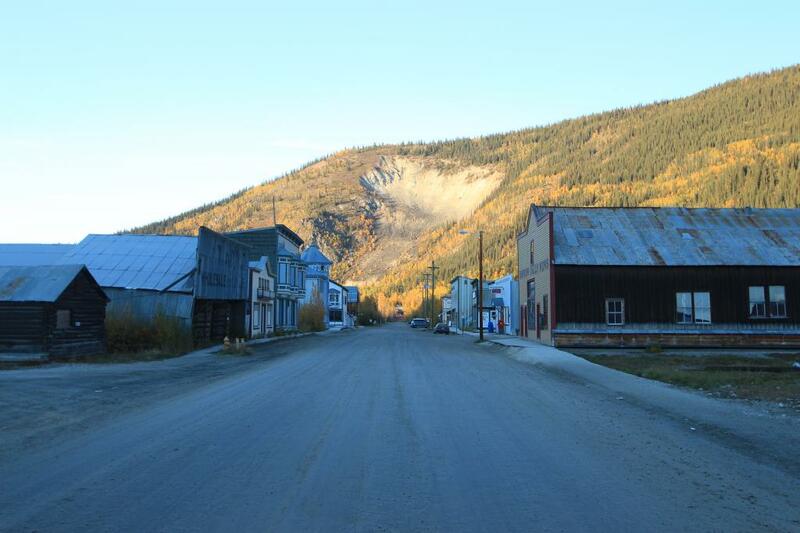 We had our eyes set on Stewart, BC, as Ryan’s research lead him to believe the place would be another quaint old gold rush town. So down the highway we went. Along the way we looked for signs, but inadvertently passed the abandoned asbestos mining town of Cassiar. Abandoned ****, especially whole towns peaks my curiosity. so I was a little bummed it was missed. Unfortunately, we didn’t have the time to backtrack and search for the place so we stopped for a quick bite in Jade City and moseyed on. More good fortune on our side as the AMA maps Ryan had made were proved wrong and we did not encounter any of the 275 kilometers of gravel road that was promised us. Thank goodness, as those blizzacks might not have taken to it well. The highway and scenery surrounding it were beautiful as promised, but unlike the Dempster/Alaska and Klondike highways, the lookouts were non-existent and/or poorly marked. So there were few stops made on this leg. The last 60 kilometers into Stewart on the Glacier Highway were spectacular. Gone were the autumn trees, and we coasted down the hill into a seemingly rainforest-esque valley. Waterfalls streaming down the mountain sides, trees overgrowing the road, it was unreal. But again, it was a two-lane undivided highway with no shoulders. So, if you’re ever in the area, the drive to Stewart is worth your while. Fortunately, we did manage to pull over at Bear Glacier to snap a couple pictures before wandering down into Stewart. Stewart, BC. Not much to see, and even less to do. There was no cell service, no old school pubs, just ****ty restaurants and run=down hotels/motels. Quite disappointing to say the least. We snagged a room at the King Edward Hotel, who’s rooms and décor pre-dated both Ryan and I, and visited the attached grimy little bar for a quick bite to eat and some beers. Instead of wasting any more time here, we packed it in early so we can get a fresh start the next day and get out of there. Day 9: The home stretch. We were now 5,700 kilometers into the trip and starting to get sick of driving. 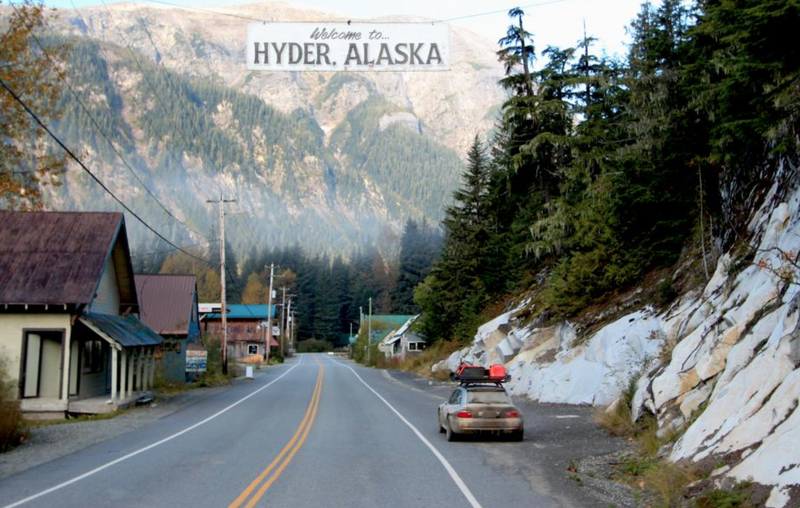 We made a quick, but necessary rip into Hyder, Alaska, just to say we did it. That being said, we spent less time IN Alaska, than we did explaining to the Canadian Border Patrol folks trying to get back into Canada, ha, ha. Fortunately, today was another short day; a mere 400 kilometers from Stewart, BC, to Houston, BC. Home to my wonderful sister, brother-in-law, and two amazing nephews and niece. Just 45 minutes outside of Houston, we made a quick pit stop in Smithers, BC, for some gas and nibbles. 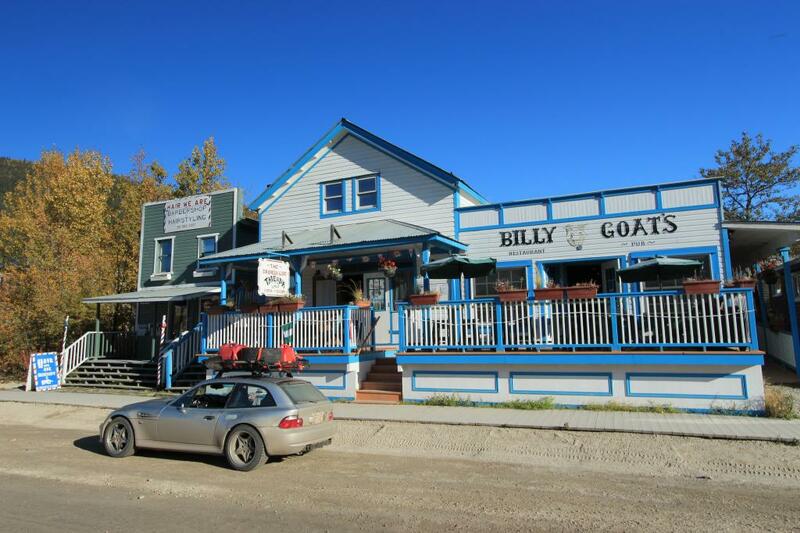 If, for some strange reason you find yourself in Smithers, visit the Alpenhorn Pub and Bistro. Order up the three-cheese nachos with pulled pork and thank me for it later. Jumping back into the coupe, we cruised our way down to the metropolis of Houston. It had been over 4 years since I’d been up there to visit them. So it was great catching up, seeing those little hooligans terrorize the house, and play Legos with the boys. I felt like a kid again rummaging through thousands of Lego pieces; it confirms the fact that growing old is inevitable, growing up is optional. The kids were so proud to show off the six newborn golden retrievers in the back yard. They were adorable little buggers, eyes still sealed shut and everything. Then came the feast: steak, crab legs, twice-baked potatoes, cauliflower salad with all of the fixins…man-o-man did I fill my belly, and with good quality home-cooked food, not the pub grub that has sustained us thus far. After the Lego airplane was built, and the kids went to bed, we sat around the kitchen table, drinks in hand, exchanging laughs and stories. Confirmed, I need to come here more often. Thanks for the hospitality, I miss you guys! Day 10: The 6:45 a.m. wake-up call came far too early as I was rudely awoken by my alarm clock, reminding me to open my computer and dial into a conference call for work. I’m on vacation, dammit, leave me alone! Trying not to wake the household, I slowly heard doors opening and the pitter patter of kids running about. Finishing up my phone call at 7:30, the boys were wide awake having breakfast before heading off to school for the day. After saying our goodbyes, we beat them out the door and off we went. Instead of heading straight home down the Yellowhead, we took a little detour to the south. Well, a 700 kilometer detour to be precise. Down the Cariboo highway, through the badlands of Kamloops, skirting around the Shuswaps and up to Revy we went! Ryan’s older brother is fortunate enough to call this wonderful piece of British Columbia home. Navigating our way into the city, we pulled up to the house just after 7 p.m. Fancy that, beer o’clock! We hopped on a few of Chris’ pedal bikes and made our way to Bid Eddy’s Pub. Burgers, fries and some ice cold beers please! MOAR BEERS! There’s nothing illegal about drinking and biking, right?! (Ya, I know there technically is… so get off my back). Racing back to the house, we enjoyed a few more wobbly pops before finding pillows and catching some shut eye. Day 11: Home day. For reals this time. Another 300 kilometers of mountains before 400 more kilometers of meh and blech before we’re back in Edmonton. Ryan arranged to cross paths with his parents and sister-in-law in Lake Louise for lunch as they were en route to Revelstoke, so we sat down and explained as best we could, in the time we had, the adventure we’ve been on to date. I’ve known Ryan for upwards of 8 years, have stayed at his parent’s place in Calgary several times for car shows, but have never met his parents. It was about time! We thanked them for the meal, shook hands, gave hugs, exchanged well-wishes for safe travels and were homeward bound. Pulling into Edmonton around 6 p.m., we did what only seemed fitting—hit up our local drinking hole, Joeys Mayfield, for victory beers! With the rally-esque BMW hard-parked out front, in we walked. Great success, many good times, much memories. Inuvik or bust. 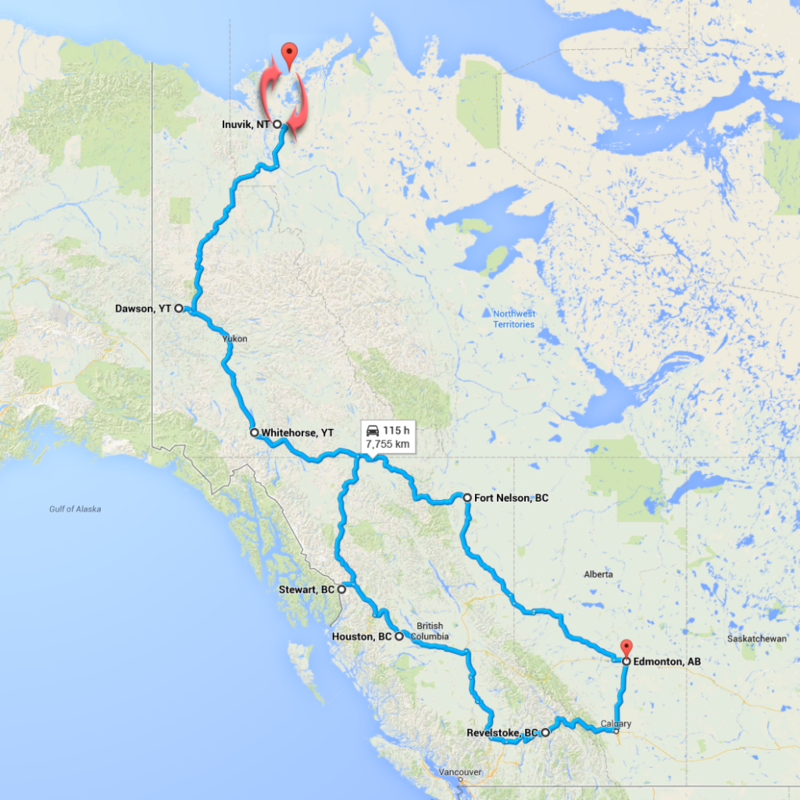 7,755kms, 2 Provinces, 2 Territories, 1 state… because road-trips.